Dwarf Algerian tangerines are a cultivar of mandarin (Citrus reticulata) that are usually called "Clementines", according to Purdue University. 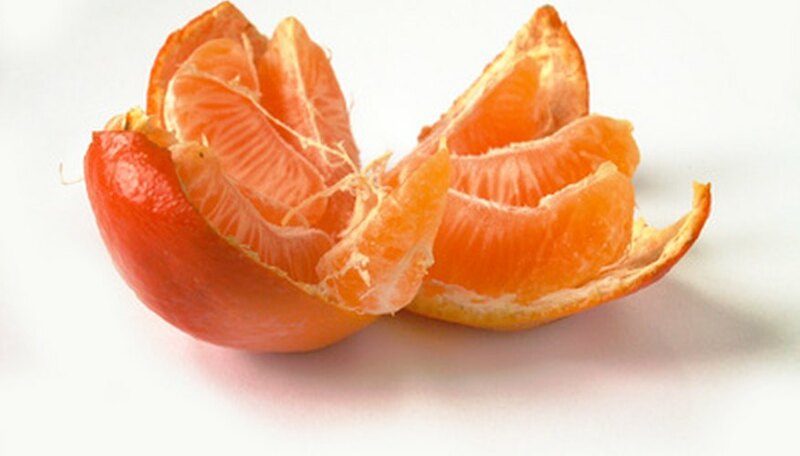 Mandarins or tangerines are a class of oranges that have very thin, easily-removed skin. They are often eaten out of hand, straight from the tree and are very popular in South America. Algerian tangerines were introduced to the United States in the early 1900s, according to Purdue University. Native to Algeria, the species was discovered by a French missionary named Clement. The dwarf cultivar of the Algerian tangerine was created in the mid 1900s, when botanists began grafting citrus trees onto dwarf rootstock. Dwarf Algerian tangerine trees have rounded canopies and dense foliage that can droop to the ground if left unpruned. They can grow up to 8 feet tall or remain as small as 3 feet if grown in containers. Nondwarf cultivars are naturally small trees, growing up to 15 feet tall. The leaves are dark green and narrowly ovate. The fruit is a medium size for mandarins, deeply orange, sometimes reddish in color and has a fresh, clean smell. The skin is loose and thin. Dwarf Algerian tangerine trees grow in tropical and subtropical climates, but the fruit has the best flavor and color when grown in subtropical areas, according to Texas A&M University. These mandarins are cold-hardier than many others and can survive outdoors to U.S. Department of Agriculture growing zone 8. In colder climates, they can be planted in containers and brought indoors when fall arrives. "Clementine" trees prefer a location where they will receive full sunlight. They are adaptable to almost all types of soil, save salty soil, as long as that soil is well-draining. Too much standing water will cause root rot, which is a fungal disease. Water the tree slowly but deeply when the first 1 or 2 inches of soil dry out. These trees do not need pruning other than to remove diseased or broken branches. Mulching is not necessary nor recommended for citrus trees, according to Texas A&M University. Mandarin trees in general are not usually seriously affected by diseases or insect pests (save root rot, which can be avoided by making sure there is not too much water in the soil around your tree). They are sometimes infested with common insect pests such as aphids and the citrus leaf miner. These bugs usually chew on the leaves but are not life-threatening to the health of the tree.